Wisconsin Gov. Scott Walker is facing a $3.6 billion budget gap by 2013. (CNN) -- An e-mail exchange released by Wisconsin Gov. Scott Walker's office on Tuesday has revealed a series of potential Republican concessions to a three-week standoff over a budget bill that would restrict the collective bargaining rights of most public workers. The e-mails show a discussion between Walker's deputy chief of staff, Eric Schutt, and Democratic state Sens. Tim Cullen and Bob Jauch in a correspondence that reveals offers and counter-offers between two sides who have remained at an impasse since mid-February. Walker's initial proposal -- which passed the state's assembly on Friday and would exclude police and firefighters -- requires public workers to contribute more to their pension and health care plans, while prohibiting collection of union dues. It would also restrict the collective bargaining power of public-sector unions to be limited to wages, and would be capped to the rate of inflation. Pay raises beyond the inflation index would require a voter referendum. The original bill would also restrict contracts and would mandate annual votes for unions to keep their certification. But in this latest e-mail exchange, dated Sunday, March 6, Walker appears willing to take steps that would curtail the proposal. -- Allow unions to bargain for wages beyond inflation rates, without a mandatory voter referendum. -- Permit collective bargaining on certain economic issues, including mandatory overtime, performance bonuses, hazardous duty pay, calendar and classroom size, as well as certification or license payment. Unions and public employers would be required to define the parameters of the negotiations in each case. -- Allow public workers at the University of Wisconsin Hospital and Clinics Authority to keep their collective bargaining rights. -- Permit public workers to collectively bargain workplace safety issues, while restricting workers from negotiating hours, overtime, sick or family leave, work breaks and vacation. -- Limit collective bargaining agreements to one or two years. -- Require unions to register less than one year after the bill is signed into law, and compel their registration every three years to stay active. The original measure would mandate annual certification. The modifications do not address Walker prohibiting unions from collecting dues, often considered a sticking point in negotiations. Later Tuesday evening, Democratic lawmakers offered an "alternative adjustment bill" in an open letter to Walker and Senate Majority Leader Scott Fitzgerald, identifying three areas where the Wisconsin state budget is facing shortfalls: medical assistance, public defender, private bar and the Department of Corrections. "Recent reports made it clear that Wisconsin is not 'broke,' as you claim," the statement said, referencing Walker's earlier speeches. The Democratic proposal requires "the same level of contributions for pension and health care that Gov. Walker proposed" and would "maintain provisions to restructure Wisconsin's debt, freeing $165 million to be used to cover shortfalls in the current biennium," according to the statement. The statement did not offer specifics in covering the shortfalls. On Monday, Walker dismissed as "ridiculous" a letter from a Democratic state Senate leader, who suggested meeting near the Wisconsin-Illinois border to discuss the budget impasse. Fourteen Democratic senators left Wisconsin for Illinois on February 17 to prevent a vote on a budget bill that ignited fierce opposition from labor leaders and their supporters. Last week, the Senate's Republican majority approved a resolution charging their Democratic colleagues $100 fines daily until they return. On Friday, Walker's office issued notices to unions, warning them of possible layoffs in early April if the budget battle continues. Wisconsin is confronted with a looming $137 million shortfall at the end of the fiscal year, June 30, and faces a $3.6 billion budget gap by 2013. Wisconsin Republicans cleared a final hurdle to a controversial proposal on Thursday after the state's Assembly passed an amended version of a bill. Protesters have been converging on the Capitol since February to protest the budget bill. Their voices are angry, energetic, accusatory. A Wisconsin Republican compared the protests over attempts to curtail collective bargaining rights for public employees to the Holocaust. 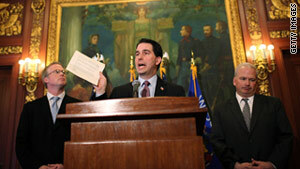 Did Walker overreach in union battle? Political experts have said that Gov. Scott Walker, in a battle with public employee unions, has overreached in his attempts to shore up budget. Wisconsin Gov. Scott Walker warned 14 absent lawmakers trying to stall his controversial budget bill to return to vote on the measure, or get laid off. The New York Times reported on the story of the juvenile detention center in Wisconsin's rural Manitowoc County, on the shores of Lake Michigan. Stripping Wisconsin public unions' right to bargain will not help the budget. Instead, the best public sector employees leave for the private sector. Who would have thought it? Wisconsin is the San Diego of the Midwest.